Vacations. Travels. Journeys. Most of us look forward with eager anticipation to the journeys of life that are on the horizon. We plan, pack, and thoroughly prepare for the journey ahead. But in life, we sometimes find ourselves on a completely unexpected journey, one that we had never planned to take. Such is where we find ourselves in this season of life. Having recently been diagnosed with breast cancer, there is an unexpected and uncertain journey that lies ahead for my husband and I. Where this journey will ultimately lead, only our Lord and Heavenly Father know for sure. However, as unplanned as this journey is on our end, I see that the Lord is preparing our hearts and packing all that we need for this journey. The first truth for the journey – ASSURANCE. As we received the diagnosis, I was immediately reminded in my heart that I am not my own, I have been bought with a price – 1 Corinthians 6:19-20. What assurance it brings when you know of a certainty that you belong to God. Because you have been redeemed (bought by the finished work of Jesus Christ on the cross) you are a child of the Living and Almighty God, and as such, your perfect Heavenly Father will care for you on every step of this unexpected and uncertain journey. From that assurance comes great rest and peace. Nothing else, nor anyone on this Earth, can give that kind of rest and peace. I know I will need to rest in the loving arms of my Father throughout this uncertain journey. Interestingly, the second item for this journey is something that I am not allowed to bring with me. I thought about my travels to visit my son and his family overseas. There were certain items that I was never allowed to pack. Such would be the case on this journey. God spoke very clearly to my heart that I am not to bring FEAR with me. Fear is the natural and understandable reaction to the news that you have cancer. But immediately the Lord began bringing Scriptures to mind to FEAR NOT! As I took a concordance and walked through the Scriptures, over and over God’s people were instructed, yes commanded, to fear not. In addition, God gave the reason that they were not to fear. The overwhelming reason was that HE was their God and that HE was with them. I spent many hours in those Scriptures, with a greater and greater understanding of why fear should not be in my life. 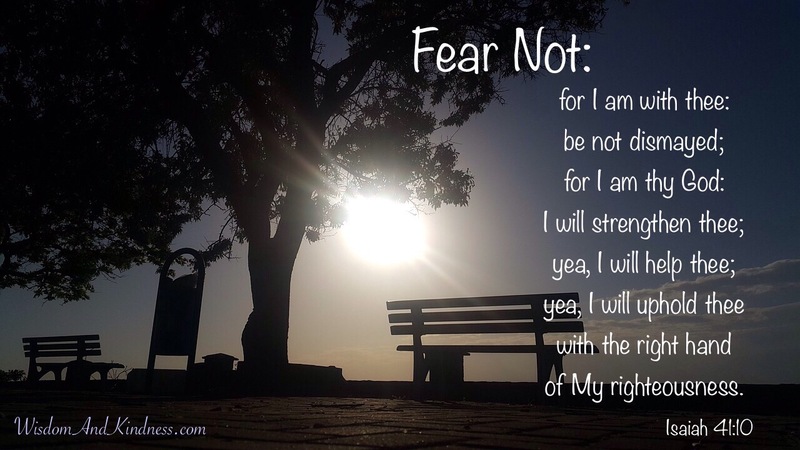 I believe Isaiah 41:10 explains it best: Fear not, for I am with you: be not dismayed; for I am your God: I will strengthen you; yea, I will help you; yea, I will uphold you with the right hand of My righteousness. Again the reason that I am not to fear is because He is my God, and He has said that He will strengthen me, help me, and sustain me. He has also said that He will never leave me nor forsake me. Faith, in its very essence, is knowing what God has said and trusting Him to do what He has said. Therefore, I must walk by faith, and not by sight. He has said: Fear not, therefore my heart’s response to Him is: I will fear no evil, for Thou art with me! I know of a certainty that fear will want to creep into this journey because fear is such a strong, natural human emotion, from which I am not exempt. But I also know of a certainty that the Lord does not want fear on this journey. I will trust His grace to help me walk there day by day. The third item the Lord prepared in my heart for this journey is CALLING. Every true believer should know his calling in life. It is God Himself who calls, equips, and places one where he is to serve. God has called me to Himself to be a child of His. That calling will not change – not on this upcoming journey, nor on any journey in this life, nor throughout eternity. Secondly, God has called me to be the wife of one man – my precious husband. During our 39 years of marriage God has taught me much about being a wife, help, and companion to this one man. That calling will not change. I am to continue in this calling in every way that I am able, even through the ups and downs of the journey. As the Lord began to cement this in my heart, there was one day that I wanted to mope around. The Lord gently reminded my heart that I wasn’t having a mastectomy TODAY, and that I wasn’t having radiation TODAY, and that I wasn’t having chemotherapy TODAY, so what was I going to do TODAY? My heart’s response was: I am going to be David’s wife today! With that truth, I set about having a blessed day. Since that day, I have been frequently reminded to just continue to be David’s wife. That is my place in this life and that will not change. I was reminded of a portion of our wedding vows: in sickness and in health. That vow must be true, not only to the kind of husband David will be to me, but the kind of wife I am to be to him. Additionally, the Lord has called me to stay under my husband’s leadership (headship) as I trust the Lord with every step of this journey. The Lord has spent years teaching me to see the goodness of God in following a husband’s leadership. That, too, must not change. God had called me as David’s wife, and all that that means shall not change for as long as we both shall live. And the third part of my calling in this life – As a Christian, God places us in the body of Christ. There He gifts us and equips us to serve one another for edification – to build up the body of Christ. That calling would not change either. Though it seems that I fail at this so often, I am still to be about encouraging fellow believers. Yes, there could be such a tendency to shut oneself away from all others, but that is not God’s design. Everyone has times of struggles, trials, hardships, and difficulties. No one is exempt. It is part of the fallen world in which we live. But as fellow believers, we are to encourage one another, pray for one another, comfort one another, help one another, and love one another. This calling would not change. As I walk through this unexpected and uncertain journey ahead, as God Himself faithfully sustains me, I am to encourage others facing the struggles of life. By sharing truth and proclaiming His faithfulness, may I be found true to that calling, as well. So in all three of these, to God Himself, to my precious husband, and to fellow believers, may I be constantly reminded: the gifts and calling of God are irrevocable – Romans 11:29. Those things will not change. I know this is only the beginning of this unexpected journey as God prepares my heart for this path. When one looks at our situation with earthly eyes, it seems as if there is a one way path ahead, from which we cannot turn away. Above this path is a dark and ominous cloud encapsulating the word “Cancer”. Earthly eyes would see that only darkness lies ahead on that path, but that CANNOT be so for the Christian because God is already ahead of us on the path, and of a necessity light must be there because God is light and in Him is no darkness at all. I know that I understand nothing yet of the path that lies ahead, but I know the God in whom I have believed. I have been reminded of words penned by Daniel W Whittle in one of his well-known hymns. I close for now, as I share those meaningful words with you. ← Am I “On Task”? Beautifully written dear sweet lady. My prayers are with you. Love you!!! Thank you! It is so nice to see your writings again. I appreciate them and delight in knowing that you remain faithful in the gifts the Lord has given you. When I sent the last email I was delighted that you sent me your writings. However, I had not explored it until I sent the email. I am at a loss of words. These words are comforting and yet quieting of the heart. I had been faced with the reality that Jim may of had prostate cancer and all the thoughts that go with the flood of fear. The Lord has been gracious that the results were negative. I am so thankful for your words, they are encouragement. Yet, I come back to the heavy heart for you. Know that I am praying for you and much comfort for you and your family. Please keep me informed of your progress. Your steps through this will be greatly used to sustain the faith of others. Does Barbara and Margot know? Thank you Donna for expressing your mature faith in a God who never fails! I pray that my faith will be the same if faced with a similar trial. It is so refreshing to see that your focus remains on God and not on yourself. I am so saddened that we live in a day and age where the “name it and claim it” movement is so prevalent. These beliefs lead to us grasping, fighting and trying to believe something that God never promised us in the first place. It puts the ball in our court instead of God’s. It makes us feel like we have control over our situation and that we can somehow determine the outcome of our situation based on how much faith we have. It also puts the focus on our earthly bodies and the here and now not eternity and God’s kingdom. Instead, we can pray for healing and trust in the perfect will of our Father who loves us, is with us, will comfort us, will never leave us, can heal us if He chooses, and had our days numbered before He created us. Some say this is not real faith and will result in “giving up”. I think this is real, biblical faith that leads to true rest and peace. Thank you for sharing your faith with us. It is inspiring! I love you and I’m praying for complete healing! Thank you for sharing. I am Mary Spray’s cousin. I truly find your posts uplifting, frank, and filled with the Spirit. I am praying for you and your family.